Alan was born in Birkenhead on the 30th November 1920 to Cornish parents. He was the fourth son of five brothers and two sisters. Although his parents were Cornish they previously resided in Stevenston and returned there less than a year after Alan’s birth where his father worked for ICI. His early education was at Stevenston primary and Ardrossan Academy. In the summer he was working in the lab with ICI at Ardeer awaiting the start of a medical degree course at Glasgow University. With the outbreak of war, although he was in a reserved occupation, he volunteered for an officer’s course with the Royal Navy. In the meantime he was sent to train as a torpedoman in Portsmouth and was involved in the clear up after the severe bombing of the town and docks in late 1940. He joined HMS Exmoor, a Hunt class destroyer at Wallsend-on-Tyne in February 1941 and served as Navigator Seaman in the North Atlantic then round Africa to the Mediterranean. When his father died in 1943 he spent some time in a desk job in Portsmouth. Subsequently as a Leading Seaman he was sent across the Atlantic through the Panama Canal to the West Pacific on the Landing Craft Carrier Empire Battleaxe attached to the United States Navy. In June 1944 Alan married Jean Wilson from Stevenston. This was a marriage that was to last for 62 years. After demob he obtained a BSc in Maths and Physics at Glasgow University and a Teacher’s Certificate at Jordanhill College. It was during this time that his two sons Alisdair and Graham were born. 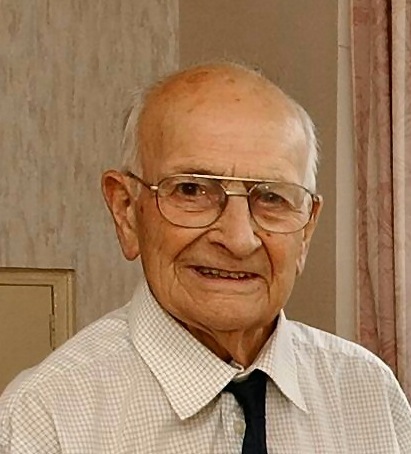 His first teaching job was at Patna in 1951 at which time the family moved to Crosshill. They still have the same house 56 years on! In 1952 he went to Carrick Academy initially teaching Science but subsequently taught Maths for almost 30 years. He retired in 1982 as Assistant Rector and Head of Guidance. In 1946 he joined British Legion Scotland and enthusiastically supported them all his life serving many years as Branch Secretary. After the closure of Crosshill Branch he joined Prestwick. Latterly he took an unofficial but keen interest in the work of Hollybush House. Alan enjoyed his bowling and was for many years Treasurer of Crosshill Bowling Club and served a year as President. He was an enthusiastic member of the South Ayrshire ex-Presidents Bowling Association and had a life Membership. The highlight of his bowling career was when he was a member of the Crosshill rink which won the Scottish Senior Fours Championship at Ayr in 1996. A founder Member of Maybole Toastmasters which evolved into the Carrick Speakers Club he was a member of the original Social Club Committee which was the forerunner of Carrick Sports Club. Although he was not, for health reasons, still involved with the Club he organised a group of Crosshill cronies to attend the annual Burns Supper and was planning this year’s trip. Alan served as District Councillor for Crosshill in the days of the County Council from 1960 until 1975 and became a JP in 1970. Lately deteriorating eyesight and general health had forced him to give up bowling and driving but he still remained active in his garden and home. His death occurred suddenly at home on the morning of January 14th 2007 as he was looking forward to his granddaughter’s wedding in June.